---- Made of brass. ---- Size of the key chain is about 4 cm x 0.6 cm x 0.6 cm. ---- If you want to customize this product, please send me a Pinkoi message. 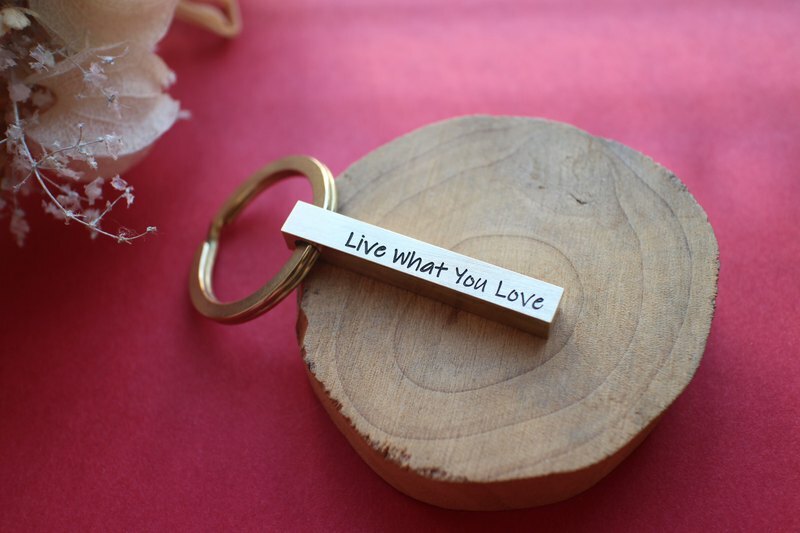 =================================================== **Product details** ◆The front of the key chain is Live What You Love ** We provide this sentence ONLY** (Customized service is not acceptable of the front side sentence.) ◆It has our logo mark on the back side of the key chain. https://farm8.staticflickr.com/7881/39891639573_e78ae5a232_z.jpg ◆We provide customized service of the back side to replace fuchia's logo pattern. (1) English letters (A-Z ,a-z, or 0-9), Maximum: 15 letters. (2) Space also counts one letter. (3) We only provide one pattern as you can see in the picture. (4) If you need customize,please choose 【Customize+150】,and send Fuchia a message to confirm your customized letters. For example: Customized letters:【 Carol Wu】 (5) You can choose you want your letters Black or not. // Black // https://farm2.staticflickr.com/1818/42994475735_bfea1d4f19_z.jpg // Normal // https://farm8.staticflickr.com/7903/46804543032_0e028424b1_z.jpg ==================================================== **How to use and maintain the key chain please check it out** https://www.youtube.com/watch?v=_l7WWieCA1g ==================================================== **Notice** ◆Handmade carving may not be 100% perfect. ◆The position of the letter may not be 100% in the middle or has the same size each time. ◆If you can not accept any imperfection which may cause during the process, please consider it seriously before you buy it. ======================================================== **Shipping Information** 1. Hong Kong /Macao Area: We use **SF EXPRESS** to deliver your package, if your location is not included in Hong Kong business areas or in remote areas, **SF EXPRESS** will charge HK$30 which is not included in the shipping fee of your original order. 2. Other areas: Airmail (will be delivered in 7-14 days.) ======================================================== **Jewelry care** Each piece of Fuchia jewelry is hand-crafted, often with rare and/or unique beads and components, all of which requires delicate handling. After each wear, gently wipe with a soft jewelry cloth and store in a jewelry box. Avoid undue moisture and should your item get wet, make sure to dry it off. You may use toothpaste with a little water to clean the brass part, but do not brush all natural stones and pearls. Before go swimming or taking a shower, don't forget to take your accessories off.